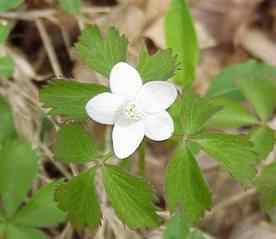 Description: From3 to 8 inches tall, with Leaves are deeply cut and appear to be divided into 3 or more frequently, 5 leaflets. 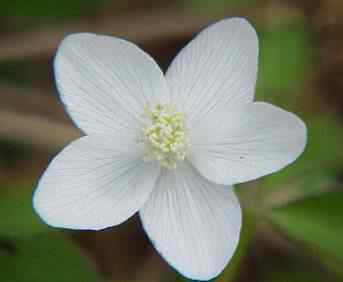 Flowers have 5 petals (sometimes 4 or 9) are really sepals, with 1 flowers per stalk. Buttercup Family, a low delicate woodland plant. Also called "wind Flower" because the leaves tremble at every whisper of the wind, "anemos" Greek word for wind. Location: Open woods, thickets and clearings, along woodland streams.